That was an odd choice you made in dreams last night. I started the dream with the guy I dated before you. We traveled a ways together, then I had to go on by myself. I had a very long way to walk to get to you. I looked for a shortcut, but there wasn't one. I just had to put on my walking shoes and head out. I was a bit concerned about my stamina, but it didn't matter because I was in such a hurry to get to where you were. On another topic, it seems that all of us widowfriends are struggling with the family-vacation season. The first year, I couldn't even bear the commercials. It's gotten a bit easier each year, but it's still sad for me. I'm so proud of myself for finally being able to take a vacation last month. It only took me three years after you died to take a week off. I still didn't go somewhere by myself - I'm not quite ready for that yet. But I did travel, and I did enjoy it. And I'm proud of myself. It's a big step for me. It's a step that some of our little widowgroup are taking now, and we're not quite sure how we feel about it. It's like everything else - we're feeling our way along in this strange new landscape. And that's why I like this photo so much. 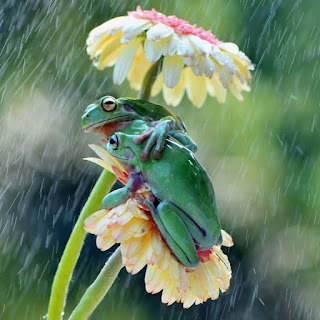 It's us, all of us, looking for shelter from the rain, huddled together, caring about each other. Even if I was traveling alone in last night's dream, know that I'm not alone. I get by with a little help from my widowfriends. Now, about that dream issue. You were supposed to make an appearance last night. Looking forward to seeing you isn't a dream; it's real life. Instructive as that one was, I would like for you to think up something fun tonight. You never had any problem planning dates in college. To be fair, we were usually studying. But I wouldn't mind doing that again. It doesn't have to be anything special - it never did. The point is being together. Wonderful. Another Way to Miss You. The House is Yellow - Who Knew?